Witnesham is a village situated roughly 4 miles (6 km) to the north of Ipswich, Suffolk. The main road from Ipswich that links the village to the town is the B1077, Westerfield Road. It is in the Domesday Book as 'Wytenesham’ (Witta’s/Witten’s meadow or enclosure) and had 10 villagers. It was a part of the old Hundreds of Suffolk of Carlford. Witnesham Hall (OS grid TM1750) was built in the 16th century, and is further west past St Mary's church on Church Lane. A murder was committed in 1896 in Rose Cottage [specific location unknown] where mentally unwell man George Smith murdered his elderly mother. 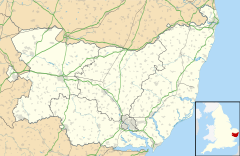 In 2009 the estimated population of Witnesham was 810, decreasing to 792 at the 2011 census. The village amenities include a 1766 inn, The Barley Mow, on Mow Hill (OS grid TM 185 503) south of Witnesham and a small primary school. The village Post Office was at the bottom of the village, nearest to Ipswich, but it has closed. Postal services are continued at the Baptist Church on a two-day basis. The village has two churches, the Baptist at the top of the village, north on Upper Road. The larger church, St Mary's OS grid TM1850, located west out of Witnesham along the Church Lane (no through lane), near the source of the River Fynn. There are several farms in the area, such as White House Farm along Wash Lane to the east and Redhouse Farm to the South-east. Westerfield railway station, situated around 2 miles (3.2 km) is served by Abellio Greater Anglia rail services to London Liverpool Street, Lowestoft, Ipswich and Felixstowe. Local businesses include Fynn Valley Golf Club, a mile south, which has both 9 and 18 hole parkland golf courses, golf driving range, golf shops and restaurant, bar and conference/function rooms. An electoral ward of the same name exists. This stretches to Playford with a total population of 1,965 as taken at the 2011 Census. Carl Giles, who created the well-known "Giles" cartoons for the Daily Express. ^ "Civil Parish population 2011". Neighbourhood Statistics. Office for National Statistics. Retrieved 30 August 2016. ^ a b White, William (1855). History Gazetteer and Directory of Suffolk (2nd ed.). Sheffield: Robert Leader. pp. 257–258. ^ "Parish population 2011". Retrieved 18 September 2015. ^ "Ward population 2011". Retrieved 18 September 2015. This page was last edited on 9 February 2019, at 03:03 (UTC).